valuable experience working with children. Tutor John started by volunteering with us in the Spring of 2015. 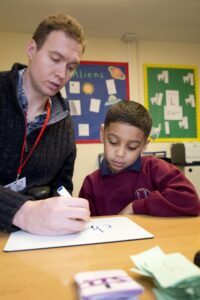 He now works as tutor across our schools in West London. What inspired you to work with The Children’s Literacy Charity? 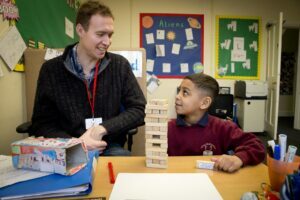 I had some experience in education as I had been running songwriting workshops in schools across South London but I wanted to further my experience of working with children. I’d never tried working in a one-to-one setting before so the opportunity excited me. It seems a little clichéd to say it but it can be such a rewarding job. When you make a breakthrough with a child, whether it be the moment they learn to consistently blend words or just being able to securely spell a tricky word for the first time, it really is an incredibly satisfying feeling. Not only have I been surprised by the confidence boost that one-to-one tuition can provide in children, but I’ve also been surprised at the confidence boost I have felt within myself in terms of my ability to communicate with children and to form bonds with them. What qualities do you think a tutor needs? A lot of patience and determination. I think it is most important to communicate clearly and calmly. What has been your biggest challenge as a tutor? Adjusting to children who are working at a very low level and find basic decoding and blending difficult. You have to find different ways to get your message across and it can take time to know which way is best. He enjoys seeing children’s confidence grow. I’m sure every child you work with is special. But could you tell us about one child who really stands out? Imran was really special and such a little character. I worked with him recently but he made such quick progress that he’s now graduated. He was new to the school and only recently came down to London from the north due to some tragic circumstances. He would be prone to sulks and crying, particularly if he found work hard or if he lost a game. By the time he left Literacy Lab he had made huge strides and his attitude to learning was transformed. What kind of support do you receive from The Children’s Literacy Charity? The charity provides training sessions in a variety of areas. There is also a good management structure with tutors, senior literacy tutors and programme managers, many of whom have different types of experience in education and with children. This means that there is always someone on hand to give you advice on teaching techniques, behaviour management etc. HR are also always on hand to help out with any issues regarding your working life and do their best to make your job as easy for you as possible in terms of location and the hours you’re willing to work. I once asked a child what one food he would eat if it were the only food left on planet earth and he would have to eat it for the rest of his life. His answer was butter. It really tickled me. Tell us about an activity that you’ve recently done with a child. What did they enjoy? The aforementioned Imran hated to do anything that involved writing for quite a while. I would ask him to write about what he did at the weekend and he’d break down in tears. However, he did love the movie Transformers so I began writing passages about the Transformers and asking him to fill in some blank words. We did this for a while and it slowly built his confidence to write independently. Eventually the tantrums stopped and he was writing his own sentences without a fuss. It would be great to hear about any positive feedback you’ve had from parents. What encouragements have there been? I worked with a child called Paulo who made fantastic progress in a short period of time. His mum came to visit us for a parent meeting and she was delighted with Paulo. She was incredibly grateful for the work that I’d done with him and it was a great feeling to know that I had played a part in making a parent so proud. When you were growing up, what were your own experiences like of learning to read? Do you draw on any of these experiences when working with the children? My generation learned to read in a very different way to the children learn to read now and it was a long, long time ago but I do remember being taken out of the classroom and reading with an adult. It definitely felt special to receive some one-on-one attention at school when you’re used to being in such a large class. What was your favourite book as a child? I loved the books of Roald Dahl. He had a weird and wonderful imagination. 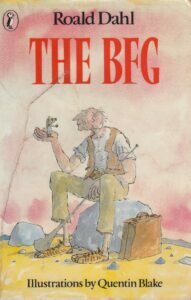 My favourite book was the B.F.G because he looked just like my Grandad! Are there any children’s books that you’ve discovered recently that you’d recommend? 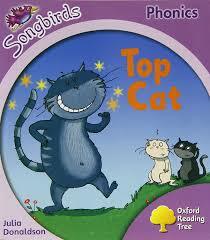 The Songbirds books are my favourites for beginners. They have great illustrations. I’d also say that I’ve found that factual books about ‘cool’ things that boys might like often engage them far more than story books. 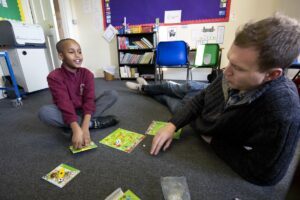 Do you think working as a tutor with The Children’s Literacy Charity will help you in future? I think this job has helped me to build my confidence in working with children and working as part of a team and they are skills that could definitely bode well for the future. John recommends the Songbirds series. Yes. It’s a very rewarding job and gives you a chance to form positive relationships with children like few other jobs can.